One could be forgiven for thinking that there are no problems associated with adaptive learning in ELT. Type the term into a search engine and you’ll mostly come up with enthusiasm or sales talk. There are, however, a number of reasons to be deeply skeptical about the whole business. In the post after this, I will be considering the political background. Jose Fereira, the CEO of Knewton, spoke, in an interview with Digital Journal in October 2009, about getting down to the ‘granular level’ of learning. He was referencing, in an original turn of phrase, the commonly held belief that learning is centrally concerned with ‘gaining knowledge’, knowledge that can be broken down into very small parts that can be put together again. In this sense, the adaptive learning machine is very similar to the ‘teaching machine’ of B.F. Skinner, the psychologist who believed that learning was a complex process of stimulus and response. But how many applied linguists would agree, firstly, that language can be broken down into atomised parts (rather than viewed as a complex, dynamic system), and, secondly, that these atomised parts can be synthesized in a learning program to reform a complex whole? Human cognitive and linguistic development simply does not work that way, despite the strongly-held contrary views of ‘folk’ theories of learning (Selwyn Education and Technology 2011, p.3). Furthermore, even if an adaptive system delivers language content in personalized and interesting ways, it is still premised on a view of learning where content is delivered and learners receive it. The actual learning program is not personalized in any meaningful way: it is only the way that it is delivered that responds to the algorithms. This is, again, a view of learning which few educationalists (as opposed to educational leaders) would share. Is language learning ‘simply a technical business of well managed information processing’ or is it ‘a continuing process of ‘participation’ (Selwyn, Education and Technology 2011, p.4)? Finally, adaptive learning is also premised on the idea that learners have particular learning styles, that these can be identified by the analytics (even if they are not given labels), and that actionable insights can be gained from this analysis (i.e. the software can decide on the most appropriate style of content delivery for an individual learner). Although the idea that teaching programs can be modified to cater to individual learning styles continues to have some currency among language teachers (e.g. those who espouse Neuro-Linguistic Programming or Multiple Intelligences Theory), it is not an idea that has much currency in the research community. It might be the case that adaptive learning programs will work with some, or even many, learners, but it would be wise to carry out more research (see the section on Research below) before making grand claims about its efficacy. If adaptive learning can be shown to be more effective than other forms of language learning, it will be either because our current theories of language learning are all wrong, or because the learning takes place despite the theory, (and not because of it). However good technological innovations may sound, they can only be as good, in practice, as the way they are implemented. Language laboratories and interactive whiteboards both sounded like very good ideas at the time, but they both fell out of favour long before they were technologically superseded. The reasons are many, but one of the most important is that classroom teachers did not understand sufficiently the potential of these technologies or, more basically, how to use them. Given the much more radical changes that seem to be implied by the adoption of adaptive learning, we would be wise to be cautious. The following is a short, selected list of questions that have not yet been answered. Language teachers often struggle with mixed ability classes. If adaptive programs (as part of a blended program) allow students to progress at their own speed, the range of abilities in face-to-face lessons may be even more marked. How will teachers cope with this? Teacher – student ratios are unlikely to improve! Who will pay for the training that teachers will need to implement effective blended learning and when will this take place? How will teachers respond to a technology that will be perceived by some as a threat to their jobs and their professionalism and as part of a growing trend towards the accommodation of commercial interests (see the next post)? How will students respond to online (adaptive) learning when it becomes the norm, rather than something ‘different’? Technological innovations in education are rarely, if ever, driven by solidly grounded research, but they are invariably accompanied by grand claims about their potential. 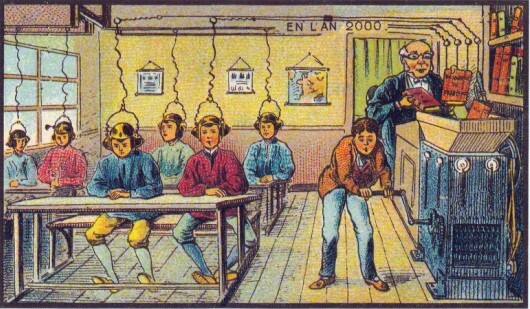 Motion pictures, radio, television and early computers were all seen, in their time, as wonder technologies that would revolutionize education (Cuban, Teachers and Machines: The Classroom Use of Technology since 1920 1986). Early research seemed to support the claims, but the passage of time has demonstrated all too clearly the precise opposite. The arrival on the scene of e-learning in general, and adaptive learning in particular, has also been accompanied by much cheer-leading and claims of research support. Examples of such claims of research support for adaptive learning in higher education in the US and Australia include an increase in pass rates of between 7 and 18%, a decrease of between 14 and 47% in student drop-outs, and an acceleration of 25% in the time needed to complete courses. However, research of this kind needs to be taken with a liberal pinch of salt. First of all, the research has usually been commissioned, and sometimes carried out, by those with vested commercial interests in positive results. Secondly, the design of the research study usually guarantees positive results. Finally, the results cannot be interpreted to have any significance beyond their immediate local context. There is no reason to expect that what happened in a particular study into adaptive learning in, say, the University of Arizona would be replicated in, say, the Universities of Amman, Astana or anywhere else. Very often, when this research is reported, the subject of the students’ study is not even mentioned, as if this were of no significance. The lack of serious research into the effectiveness of adaptive learning does not lead us to the conclusion that it is ineffective. It is simply too soon to say, and if the examples of motion pictures, radio and television are any guide, it will be a long time before we have any good evidence. By that time, it is reasonable to assume, adaptive learning will be a very different beast from what it is today. Given the recency of this kind of learning, the lack of research is not surprising. For online learning in general, a meta-analysis commissioned by the US Department of Education (Means et al, Evaluation of Evidence-Based Practice in Online Learning 2009, p.9) found that there were only a small number of rigorous published studies, and that it was not possible to attribute any gains in learning outcomes to online or blended learning modes. As the authors of this report were aware, there are too many variables (social, cultural and economic) to compare in any direct way the efficacy of one kind of learning with another. This is as true of attempts to compare adaptive online learning with face-to-face instruction as it is with comparisons of different methodological approaches in purely face-to-face teaching. There is, however, an irony in the fact that advocates of adaptive learning (whose interest in analytics leads them to prioritise correlational relationships over causal ones) should choose to make claims about the causal relationship between learning outcomes and adaptive learning. Perhaps, as Selwyn (Education and Technology 2011, p.87) suggests, attempts to discover the relative learning advantages of adaptive learning are simply asking the wrong question, not least as there cannot be a single straightforward answer. Perhaps a more useful critique would be to look at the contexts in which the claims for adaptive learning are made, and by whom. Selwyn also suggests that useful insights may be gained from taking a historical perspective. It is worth noting that the technicist claims for adaptive learning (that ‘it works’ or that it is ‘effective’) are essentially the same as those that have been made for other education technologies. They take a universalising position and ignore local contexts, forgetting that ‘pedagogical approach is bound up with a web of cultural assumption’ (Wiske, ‘A new culture of teaching for the 21st century’ in Gordon, D.T. (ed.) The Digital Classroom: How Technology is Changing the Way we teach and Learn 2000, p.72). Adaptive learning might just possibly be different from other technologies, but history advises us to be cautious.